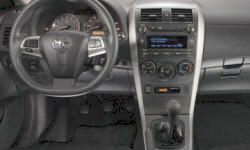 See TSBs and recalls for the 2012 Toyota Corolla. US $90 Car wouldn't turn over. It seems the engine was just flooded and I was eventually told that if I had tried to start the car with the gas floored then it would have started. Spark plugs we're also replaced while the car was in. US $20 Trunk latch wouldn't close, due to two loose 10mm bolts. Dealership fixed for free. Rear left brake light went out at 60800 miles. 64000 mi Battery was beginning to corrode. Finally got the Takata airbags replaced. Fourth notice. 68100 mi Airbag sensor light stays on after car is on. Airbags did not deploy in accident with a semi-truck that caused serious injuries to myself and my daughter's back and neck. See our lemon odds and nada odds page to see vehicles with no repairs or vehicles with more than three repairs. 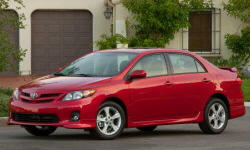 To see how frequently 2012 Toyota Corolla problems occur, check out our car reliability stats.